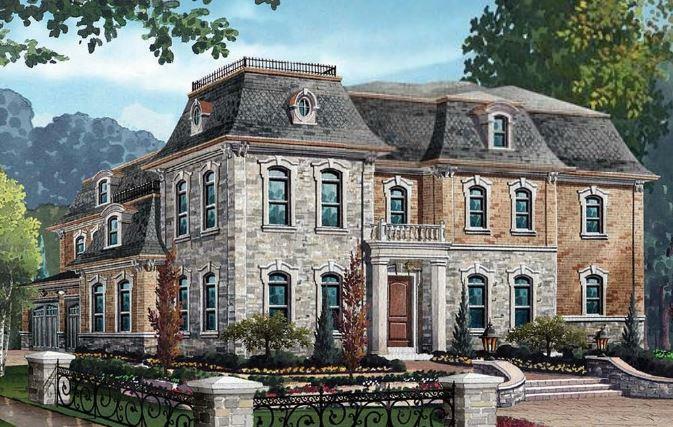 Rosehaven’s Kleinburg Heritage Estates in Vaughan is selling out fast. In addition to the model home, only three homes remain in the exclusive enclave, and it could be your last chance to move in. Potential buyers can choose from the Blue Heron or the Bright Land, which both offer over $400,000 in luxury upgrades. The residences range in size from 4,174 to 4,742 square feet and prices start at $1.7 million. Those interested can now tour the 4,647-square-foot Bright Land model home to get an idea of the quality features and finishes. Some of the impressive features at the model home include a custom Downsview kitchen, four ensuites including the spa-inspired master ensuite, hardwood throughout the main and second floors, a partially finished lower level with a bathroom and coffered ceilings. Located at 10744 Highway 27, the development is just a five minute walk away from the charming village of Kleinburg. The homes are surrounded by plenty of green space including Copper Creek Golf Club, Bindertwine Park and the Humber River. Inspired by Kleinburg’s country heritage, the development is close to all the charm and simplicity of rural Canadian life. The McMichael Canadian Art Collection, a renowned gallery featuring work by the Inuit, First Nations and the world-famous Group of Seven, is just a short walk away from the estates, making it easy for residents to immerse themselves in the history and culture of the area. The neighbourhood is also full of libraries and schools like Kleinburg Public School, creating a family-oriented community. Restaurants like Villagio and Doctor’s House and other conveniences like a Starbucks and a pharmacy are also nearby in the village. For more information, visit the presentation centre at Highway 27 and Islington Avenue Monday to Thursday from 1pm to 8pm or Saturday and Sunday from 11am to 6pm or head to KleinburgHeritageEstates.com.